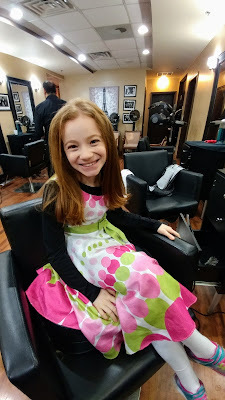 What a whirlwind week it's been! It all started Sunday night when the 4 Boston Kids arrived (thanks to their nanny for escorting them on the plane!). Our first full day of play was Monday, Christmas. We didn't have a whole lot of options for open indoor activities. Even the traditional Chinese meal was out, as DC no longer has a Kosher Chinese restaurant. 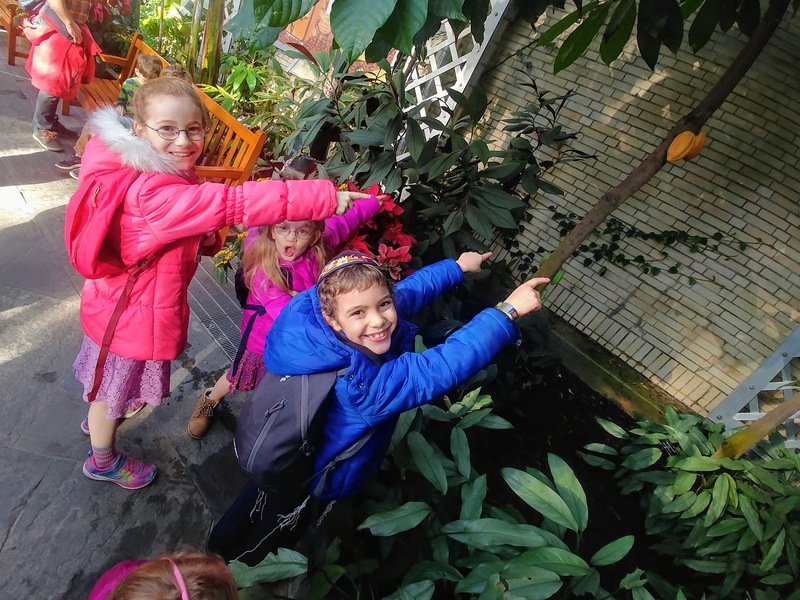 One classic choice in the area is to visit the Botanic Gardens which are open every day of the year. 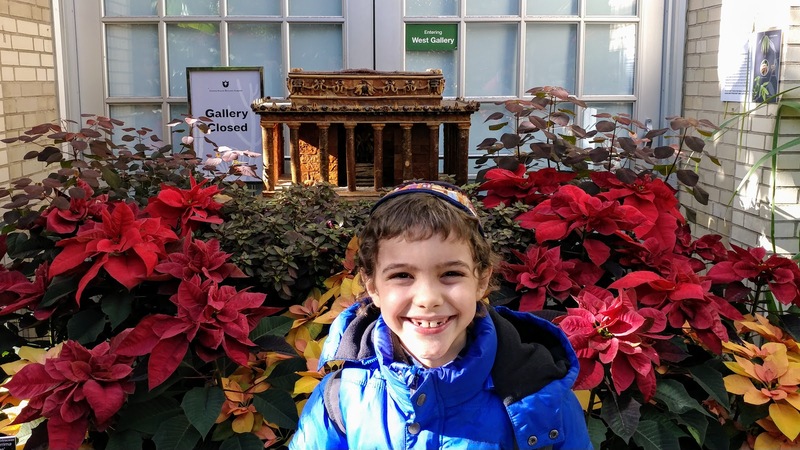 Not only are the gardens open, but there's a holiday train display as well as models of DC monuments and sites to oggle. Everybody found something to enjoy there. The kids relished seeing the Thomas themed trains in the model train display, and enjoyed playing 'eye spy' with a series of stamp-stations. I enjoyed the impressive craftsmanship of the models and loved being among the plants. And Shira was happy we weren't out in the bitter cold trying to hike. After the gardens we made our way to a good friend's house for a Christmas celebration. Our friends' two kids got along with the Boston Four quite well. At one point I peeked in on the kids playing in the basement and saw a full-scale nerf / sword battle going on. Alas, I had to be a responsible adult and return to the table, but they looked to be having a grand time! Don't feel too bad for me, as an adult I had nearly unlimited access to the delicious Christmas cookies that were served for desert. So tasty! As if the day of fun weren't enough, the toys that the kids got in a gift exchange were the icing on the cake. Monday night was the only near catastrophe of the trip. No, we didn't need to go to the ER with a child. Instead it was Shira's sanity on the line. At one point after dinner, Shira noticed that our newly painted kitchen wall was smeared with a unknown red food. Her first thought was baked beans, which we had had that night. None of the children volunteered to explain how the wall had gotten "painted." Shira put the kids to bed with a thinly veiled threat that a new kitchen might be necessary. I busted out a Mr. Clean Magic Eraser. In a few minutes, I had the wall back to spotlessly clean. I'm not sure what they put in that magic eraser, but I think it saved my marriage, my kitchen, my bank account and possibly 4 children. If you have kids, it is a must have. Tuesday morning Shira and I intended to work, while the nanny had the kids do homework. I worked exactly 14 minutes that day, so yeah, my plan of logging a few hours of work was laughable. Instead, I spent time giving the kids breafast and reading with the girls. By mid morning Shira was home and it was time to head out. 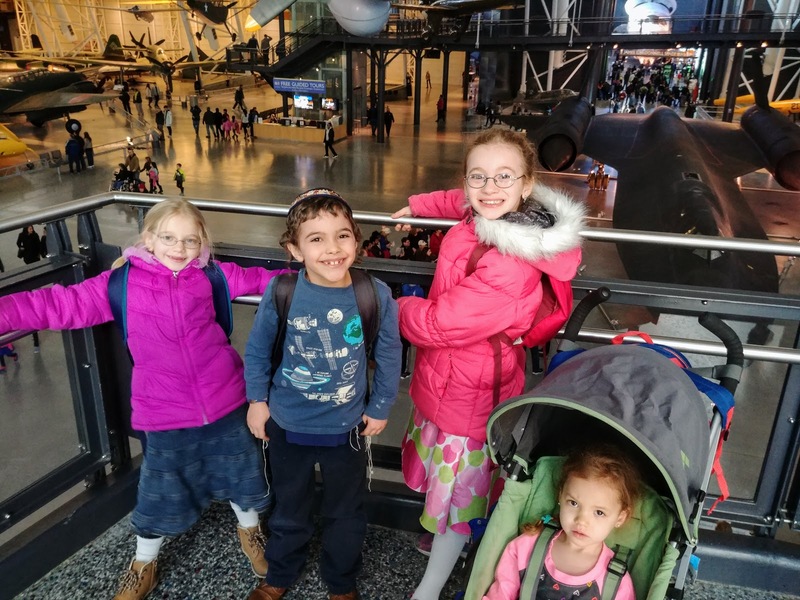 We settled on the Udvar Hazy Air and Space Museum for the day's activity. 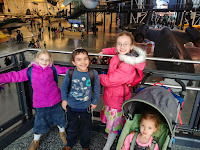 While the kids liked all the planes (Dovid was quite impressed with the SR-71 Blackbird), and of course, the shuttle, I think they were a little disappointed with the lack of hands-on activities. Dovid kept wanting to know when we'd get to go *inside* the planes (uh, sorry Dovid, that's not how it works). 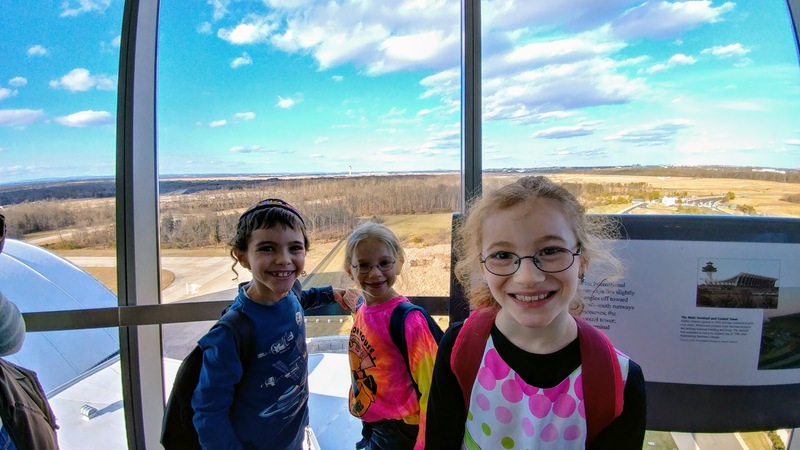 They all enjoyed going up in the tower and watching the planes land at nearby Dulles Airport. Wednesday was a truly adventurous day. We hit the road with some friends and visited Skyline Caverns. 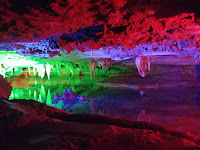 The original plan was to do Luray Caverns. I'd been there before and recalled that they were essentially the same temperature underground all year. That seemed like the perfect way to spend a freezing cold day. Ultimately, we opted for Skyline over Luray because (a) we'd never been there before, (b) the presence of anthrodite and (c) it was 30 minutes closer than Luray. It turned out to be an excellent choice. Before leaving the house, the kids asked for flashlights, which if you're descending into a cave seems like a reasonable request. I ended giving each of them a light up necklace with a keychain light attached. 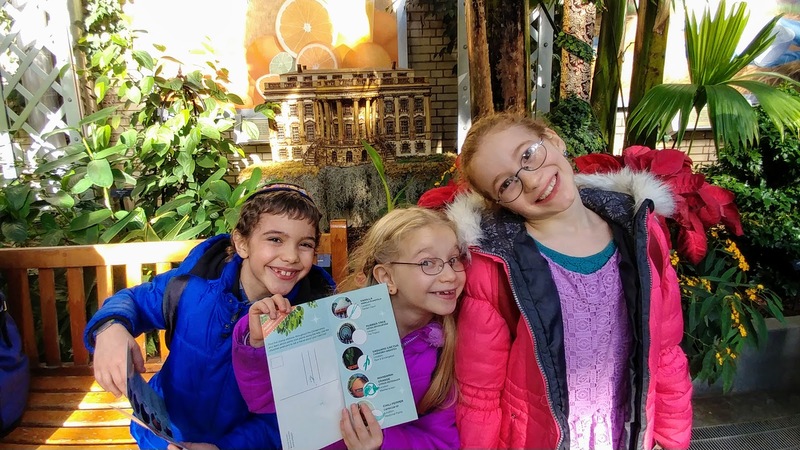 This turned out to be a good recipe, as the kids could play with their lights during the tour without bothering other participants. 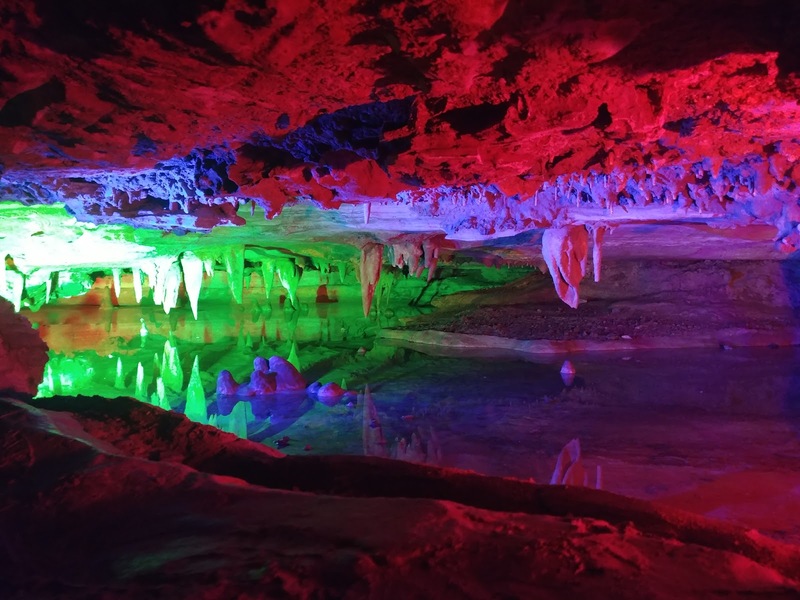 For about the first half of the Skyline Caverns tour it definitely felt like Luray's little brother. Yes, the rock formations are amazing, but they aren't at the scale of Luray's. But then you enter the section of the cave with anthrodite deposits. Wow. I'd never seen anything like that before. This cave definitely stands on its own as a truly unique and must see location, and being closer to DC definitely gives it bonus points if you have younger kids to keep occupied in the car. 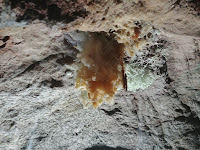 [Skyline caverns] is home of the Valentine beetle which is believed to be only found in these caverns. 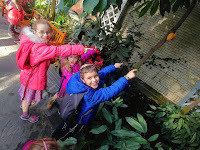 According to our tour guide, the Valentine Beetle lacks optic nerves so it is completely blind. Seven beetles were found by scientists, but when they were exposed to outside light and temperatures, all seven beetles died; none has been found ever since. The Valentine Beetle is now believed to be extinct. The said beetles are now on exhibit at the Smithsonian in Washington, D.C.
Or as our tour guide put it, on the same day scientists discovered a new species, they also caused it to go extinct. Oops. Yeah, the kids just loved this story. Thursday was supposed to be another partial work day for me. But yeah, this time I didn't even log 14 minutes of work. Who has time to work when there are four fun kids to play with (and feed and help with their homework). Tzipora drove a hard bargain with me: in exchange for me listening to her read English and Hebrew, she'd get to show me the Brave story on her iPad. And so she did. It was apparently a short summary of the movie, which now I'm really interested in seeing. Thursday afternoon we went to a production of Charlotte's Web at Imagination Stage. I have to admit, I had pretty low expectations. 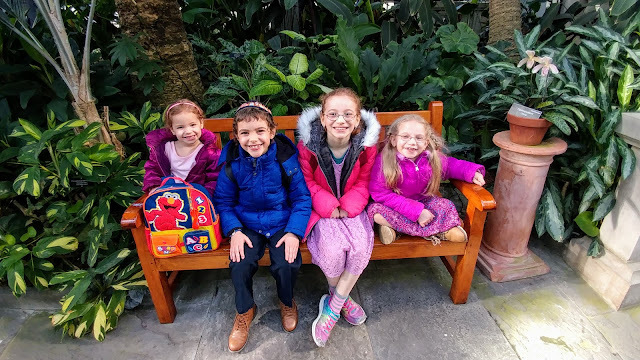 We had kids ranging from 8 to 4 years old, so I wasn't sure it was going to hold everyone's attention. On top of that, the tickets weren't particularly cheap, so even if it was good, would it be that good? As soon as the lights went down and the play began, I knew this was going work. The play held the kids rapt attention. The music, the humor, the costumes; it all worked to make a great show. The kids had seen the movie, so they went in knowing the plot, still, they truly enjoyed it. For my part, I thoroughly enjoyed it as well. I'm sure we read Charlotte's web in school or something, as I know part of the story. But I realized as the show was finishing up, I didn't know how it ended. What a powerful and profound story. I can see why it's such a classic. I also enjoyed the technical nature of the show, with nearly all the actors playing multiple rows to perfection. Of course we all loved watching the aerial acrobatics performed by 'Charlotte.' It's amazing what the actress managed to accomplish using nothing but one long piece of fabric, remarkable strength and I'm going to guess, tons of practice. Thursday night we celebrated Tzipora's 7th birthday a couple of days early. She was in charge of designing and decorating her birthday cupcakes, which she did to perfection. She selected yellow frosting with sprinkles in the shape of a 7. When asked, she explained that yellow was her fourth favorite color. Who has a fourth favorite color? (Shira was out of blue food coloring, which is how we arrived at yellow). Throughout this trip we had a new challenge to deal with, helping Dovid managing his Type I diabetes. By 'we' I firmly mean Shira. After a lesson from the nanny, Shira took over finger-sticking and shot-giving responsibilities. She also carefully architected Dovid's meals to smooth out his sugar levels as much as possible. I'm convinced that for Shira it was one long video game, with the glucose monitor relentlessly keeping score. All throughout the day and night Shira kept an eye on that number, practically willing it to behave. I naturally helped by mostly staying out of the way, and having restful sleep when she couldn't (yeah, I'm not sure how that helped, but I did it anyway). Dovid is such a trooper when it comes to his new diabetes routine. He's just rolling with the whole thing so well. Of course, it's not all bad, he did get a couple of chocolate chip cookies before bed one night because he was trending low. All in all, it was a truly fun and adventurous week for all. The kids are already talking about summer time. As for me, I'm going to need a couple days to recover before I can start planning our next adventure. Selected photos below. Full album for Mom and Grandmas found here.